We’re dealing with a whole new animal here. The fact that auto show reveals are becoming more rare and favored by pre-show unveilings preceded by teasing previews has thankfully not meant that there is less magic to be enjoyed on the showroom floor, but it’s still nice to be surprised every once in a while. Surprised is one way to describe our reaction to Genesis’ unveiling of the GV80 SUV, essentially a signal that the Korean luxury brand has aspirations far outside of the two cars it’s currently doling out to customers. A few things can be gathered from the SUV before even delving into the tech. That’s the fact that Genesis has a luxury SUV on its mind, as it should, and that its SUV lineups are likely to follow the GV naming scheme while its sedans will retain the G moniker preceding the model code. Most importantly, though, mainly because it informs us that a production version is still a ways off, is the fact that the GV80 is a hydrogen fuel cell-powered vehicle. With no nod to how far along Genesis is with hydrogen propulsion technology outside of a note that it will continue research, we’re going to take the GV80 as it is: a design study indicating that Genesis has a solid future as long as it can bring these ideas to fruition. Market speculators may not heap praise on it as they did with Tesla when it announced its 2017 Q1 deliveries, but the GV80 is proof that Genesis is tackling its biggest demon, it’s lack of a brand identity, and is doing so with success. 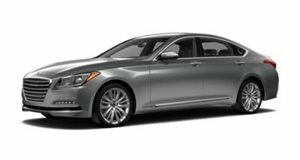 The G80 and G90 were indicators that Genesis wanted to step into the big leagues, but the GV80 does so without vaguely copying subtle design cues from proven luxury cars to style a slightly ambiguous high-end vehicle that feels solid yet has a slight air of thrift. Using an eye-grabbing grille with a diamond mesh as well as strong lines that put power and elegance on full display, the GV80 looks to be a force to reckon with yet a car that's also at one with nature. Like any good concept, massive 23-inch wheels fill the arches and add visual weight, which is slightly lacking at the top thanks to the omission of door mirrors, gone in favor of cameras. The revolutionary interior ensures that no passenger forgets that they’re driving something special thanks to an expansive dashboard sandwiched by colorful leather trim and topped by a wide 22-inch OLED display. Diamond quilted stitching on the seats and door surfaces adds luxury to the interior while a raised tunnel, presumably holding some of the fuel cell components, separates the two rear passenger seats to add a bit of exclusivity. The beauty and the heartbreak in design concepts like these is that while they look incredible, there is little chance they make it to production without being gutted of each special component. Still, Genesis has gotten so much right here that if it pulls even a fraction of the GV80’s character and places it into its current lineup, South Korea will forever earn a spot on the luxury map.